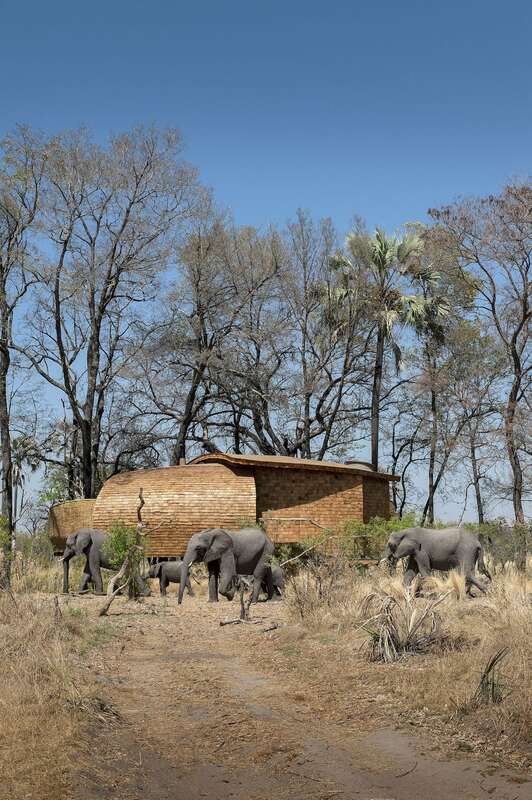 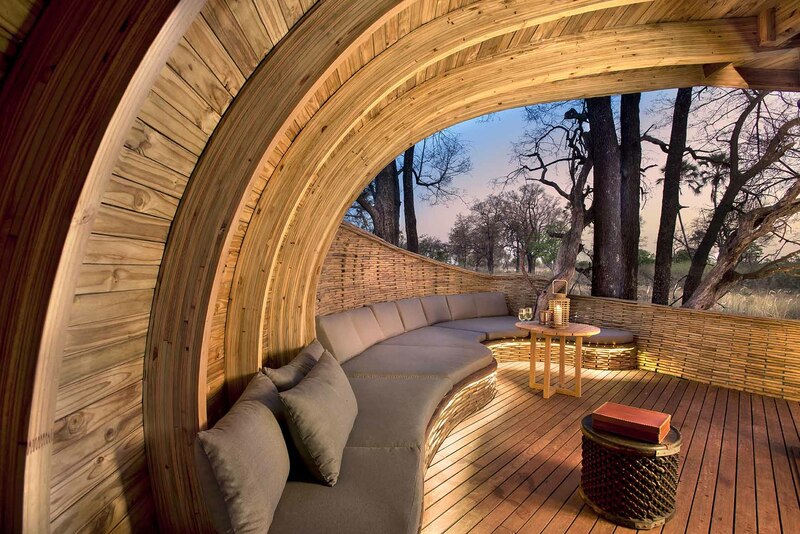 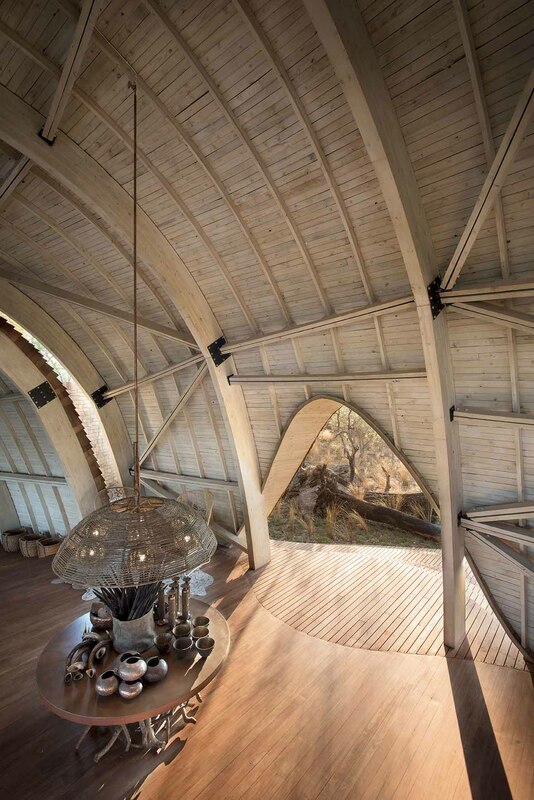 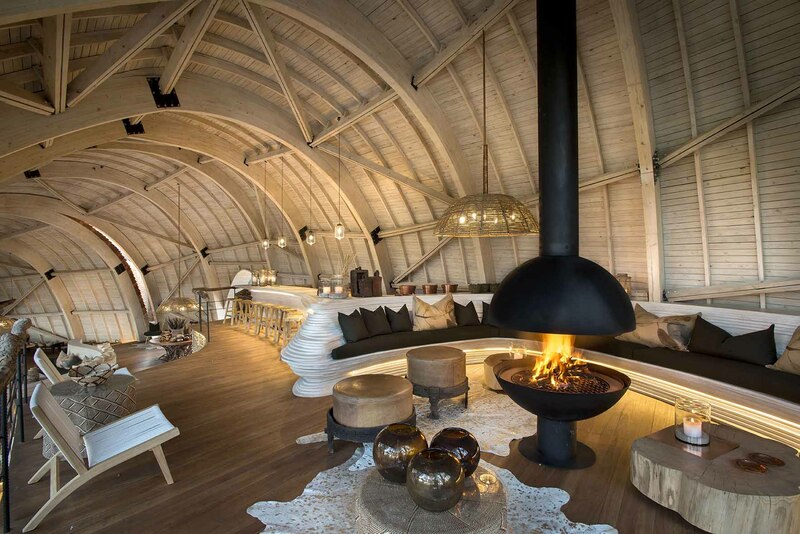 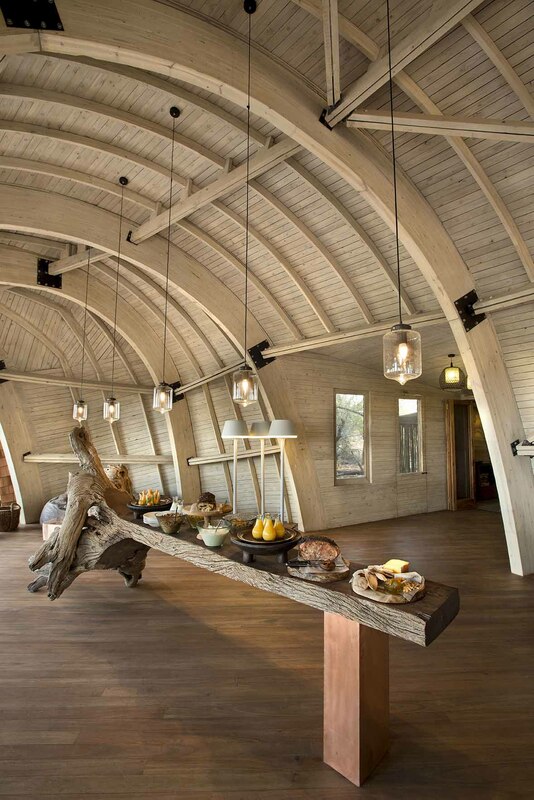 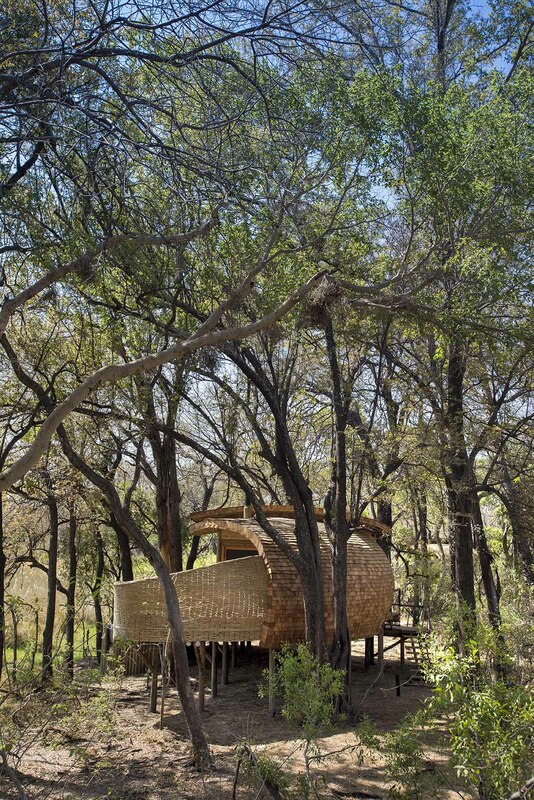 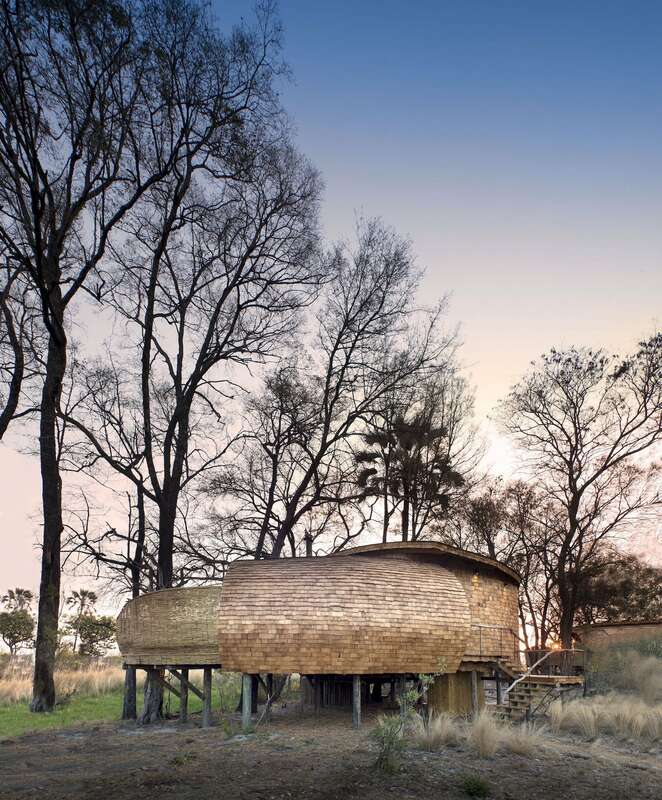 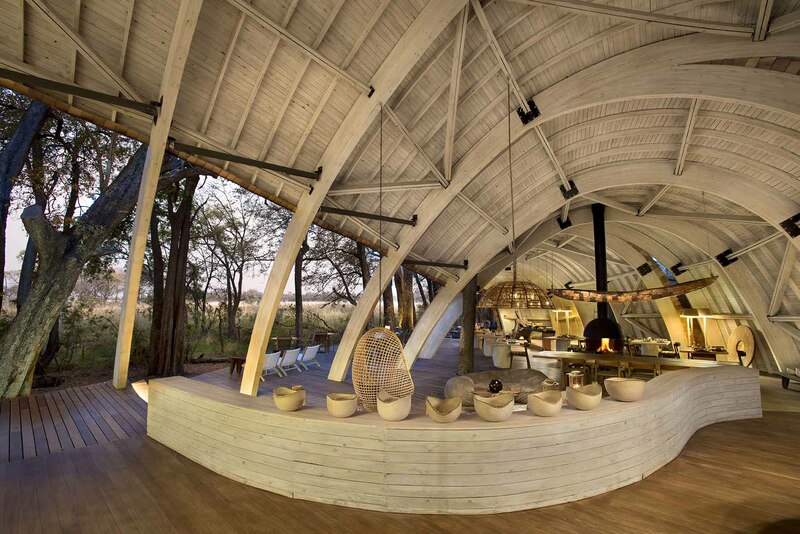 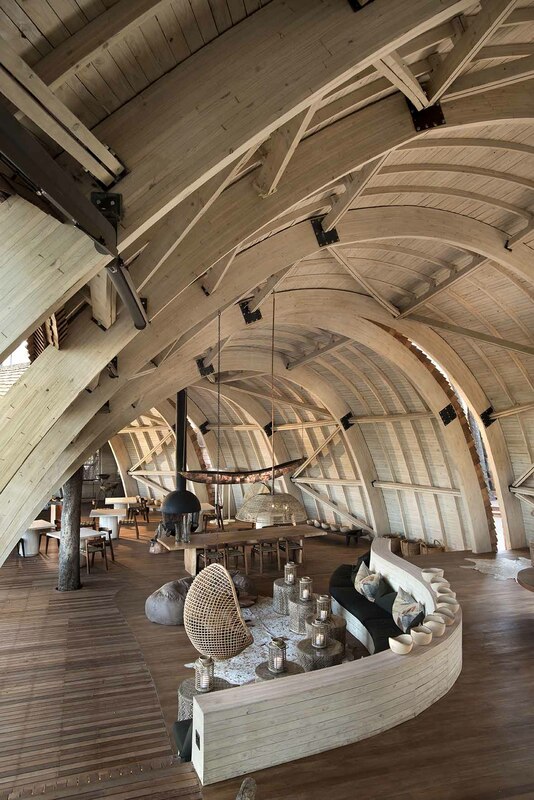 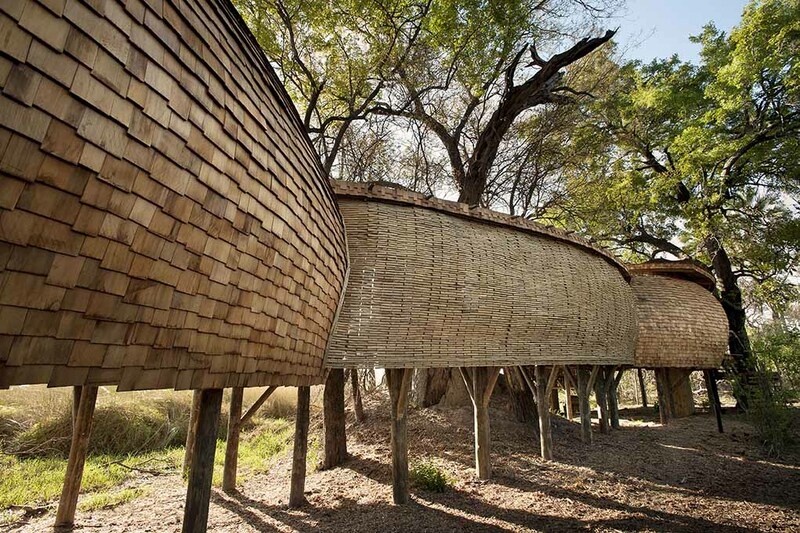 Michaelis Boyd: Michaelis Boyd Associates (MB), the London based architecture and design practice, has completed work on Sandibe, a new sustainable safari lodge in the Okavango Delta in northwest Botswana. 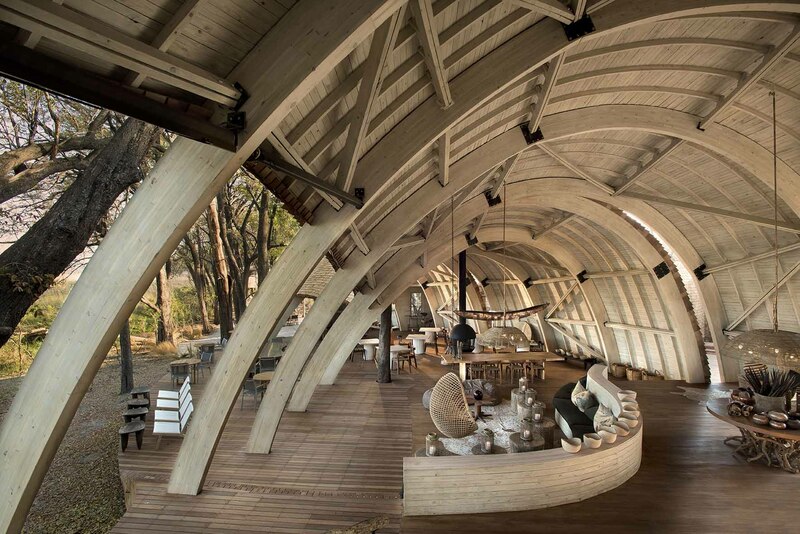 Sandibe brings an iconic new destination for the region and set a new standard for safari lodge design. 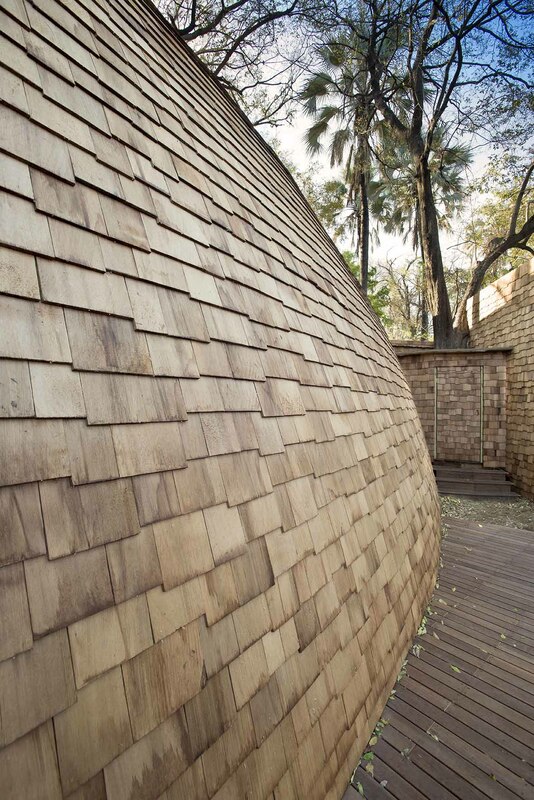 The focus for MB was to create a design with a lighter, more sustainable footprint. 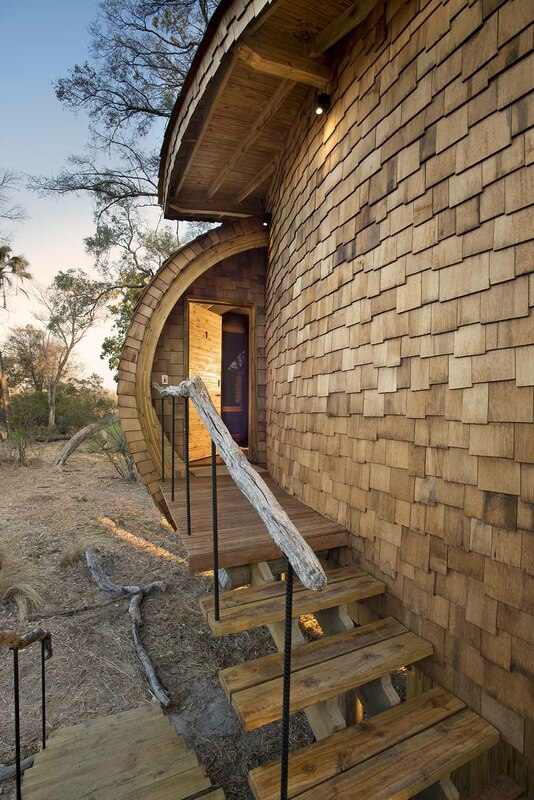 The lodge is constructed using natural materials local to the area. 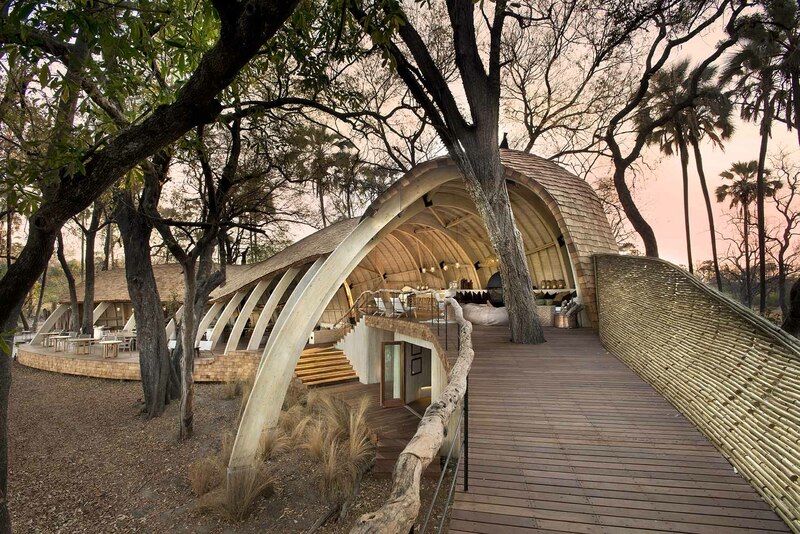 No concrete has been used in overground construction, while a solar panel farm supplies all of Sandibe’s electricity. Guests arrive at a drop off point not far away from the building, but initially there is no sign of habitation. 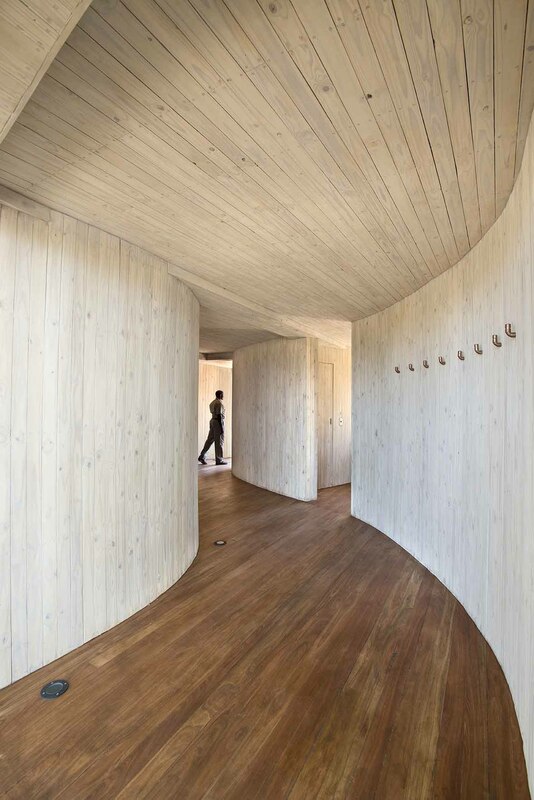 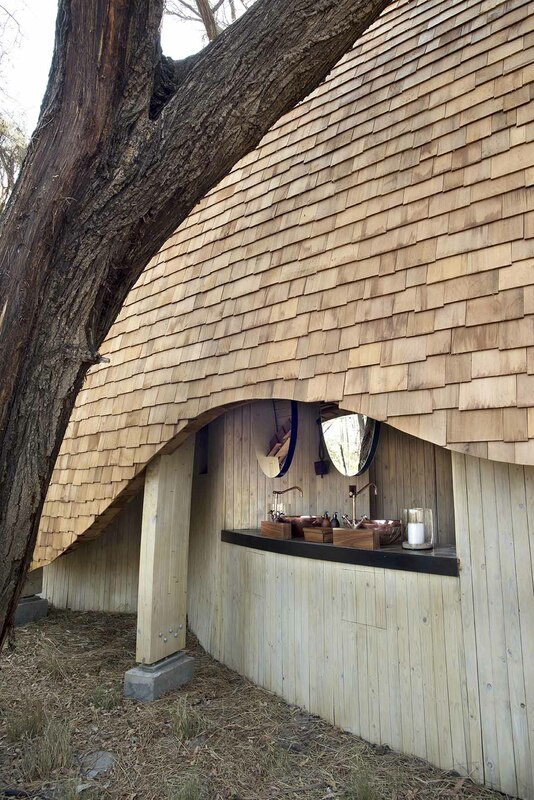 They are then led through a bower woven from saplings and laths to a threshold, which provides the first glimpse of the lodge, nestled between the trees. 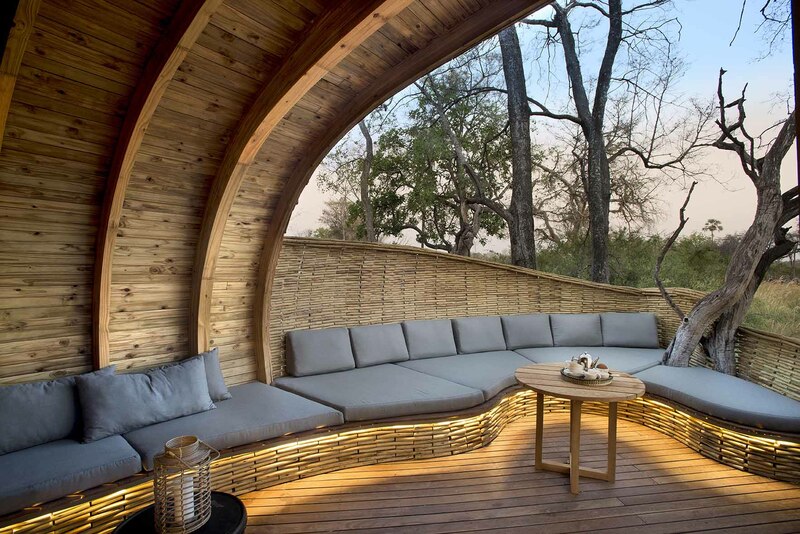 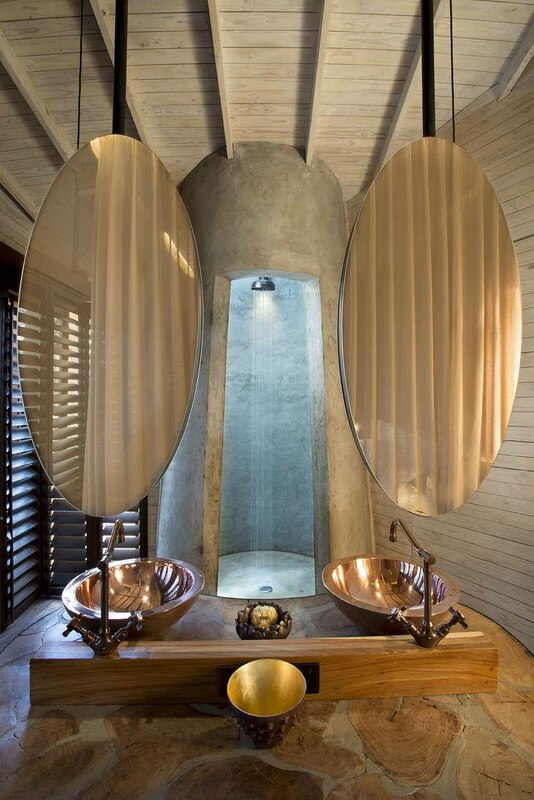 Demonstrating MB’s design focus on flow, light and space and capturing the tranquility of the region, Sandibe’s design shows a clear move away from the typically dark interiors of traditional safari lodges. 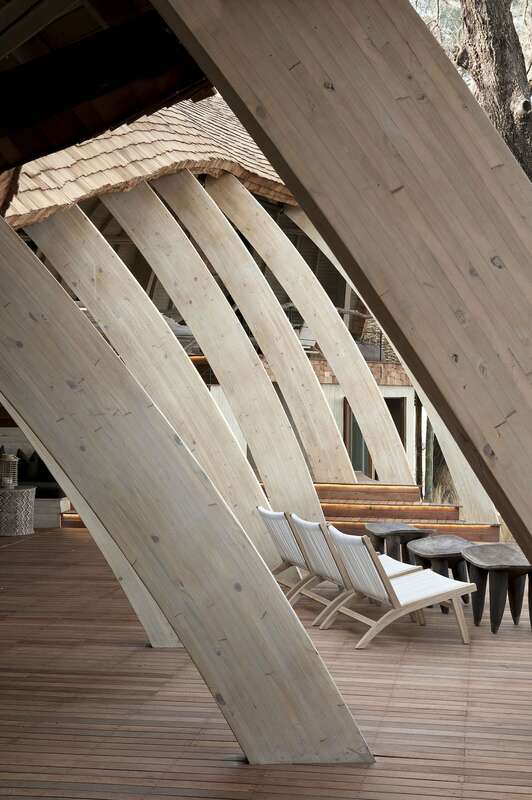 MB’s design is luxurious, sculptural and clean, from the twelve elevated guest suites to the sweeping timber ribs in the main areas leading to the dramatic curved bar. 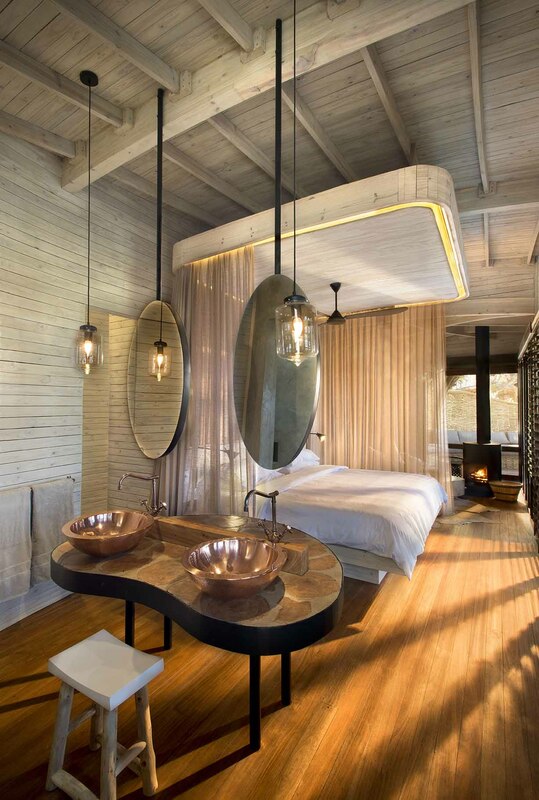 Nestled amongst a forest canopy of wild palms and fig trees with unrestricted views of the shimmering Delta, the lodge currently consists of a main building surrounded by 12 ‘private nests’ guest suites where guests can relax and enjoy the views from an open plan bedroom and lounge area. 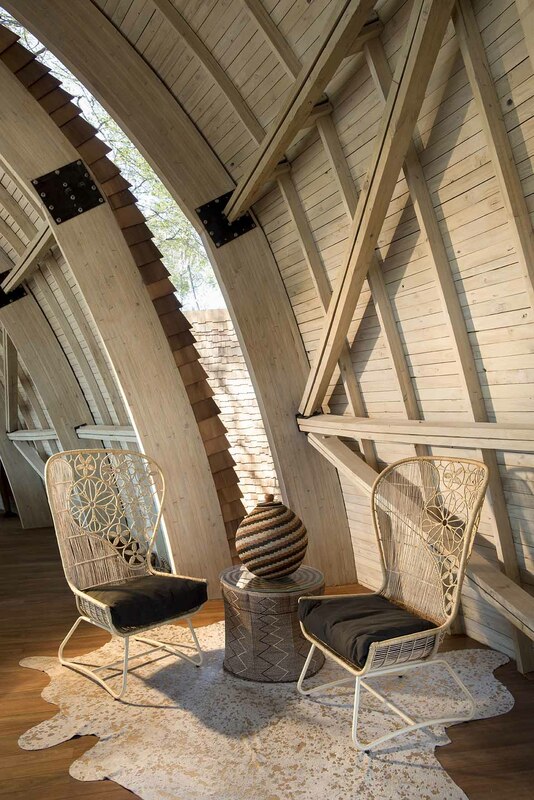 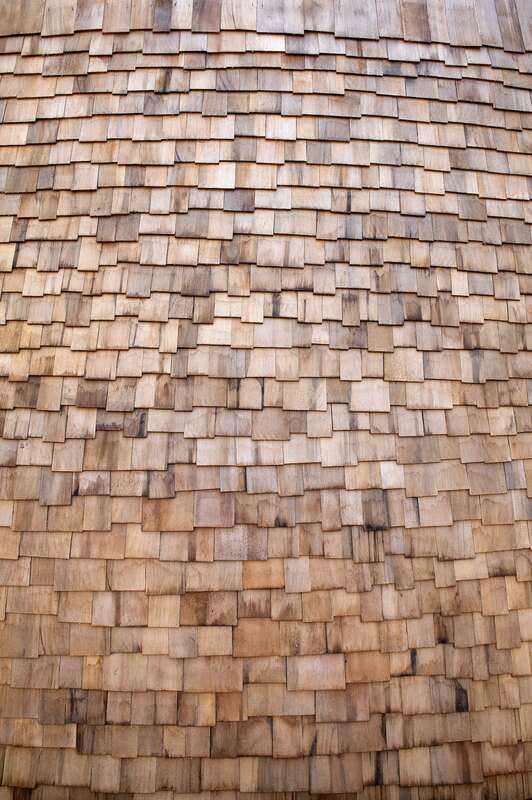 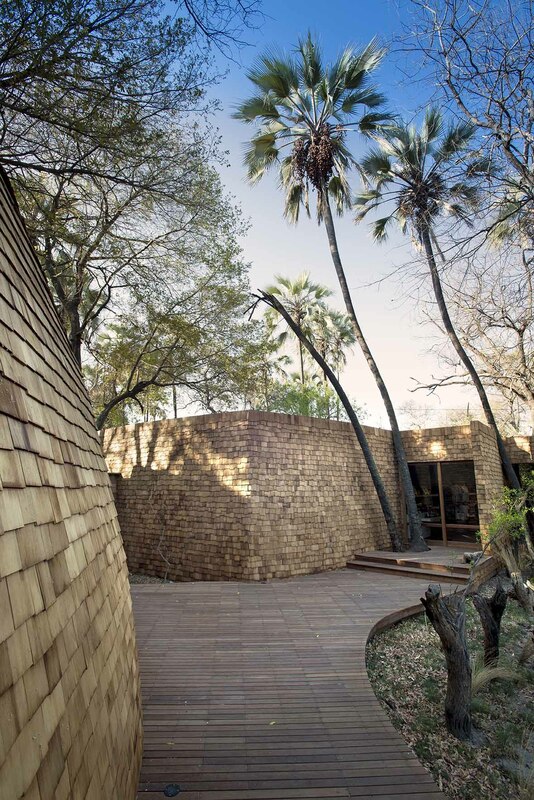 The suites, with their striking shingle- covered design, are constructed from timber and are inspired by Pangolins and weavers nests. 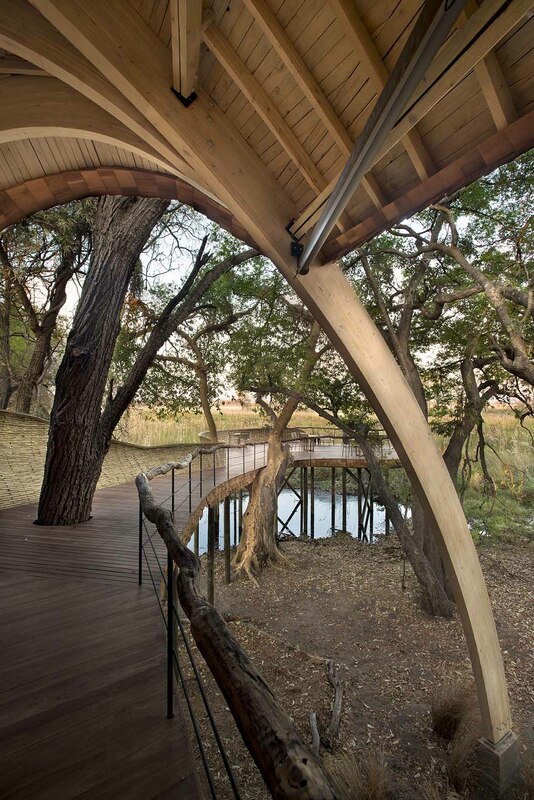 It leads out to a walkway though an old ficus tree ending in a spectacular viewing platform where guests can enjoy unrivaled views over the Delta. 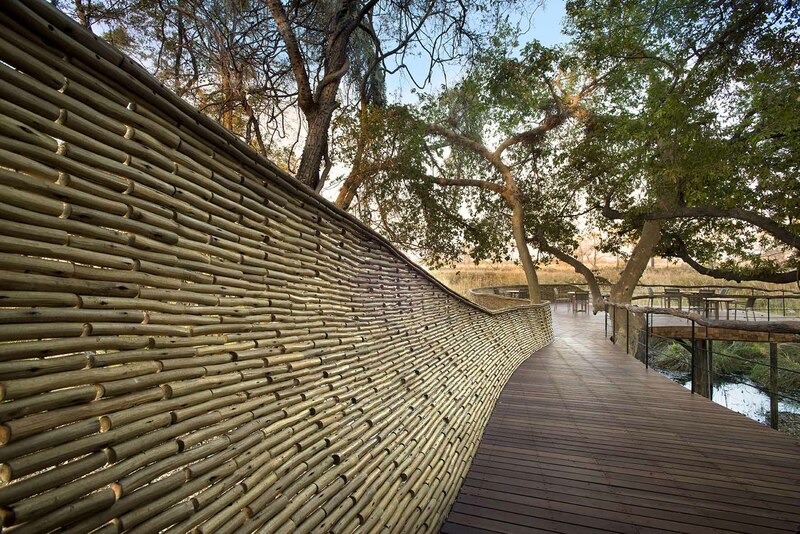 ▼抬升的小路引领游客走向端头处的观景台 The elevated path leads guests to the viewing platform at the end of the trail. 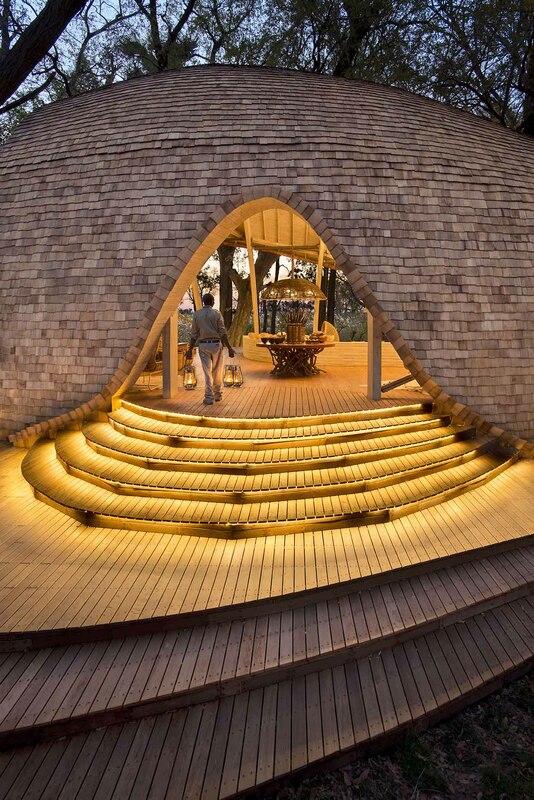 Guests are drawn up the stairs as they enter the main lodge building between segments of shingled skin, arriving on a dining terrace about one and a half metres above the ground. 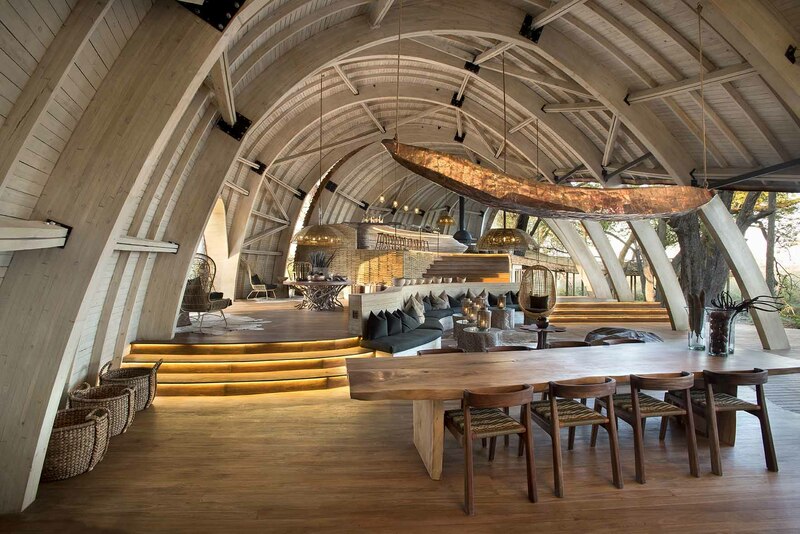 Turning left they ascend another half flight of stairs to the bar and lounge with its sweeping timber ribs and dramatic curved bar. 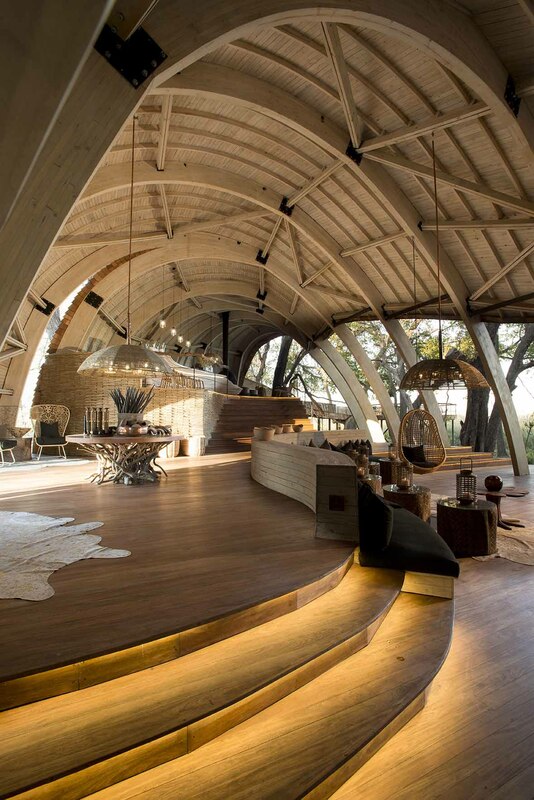 ▼客人们在休息厅时也可以看到外部景观 Guests will have chances to get in touch with the nature landscape when enter the lounge as well. 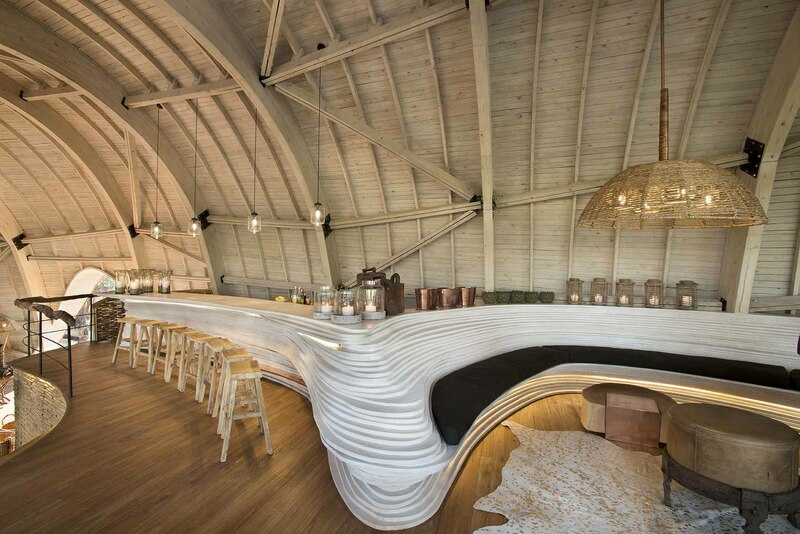 ▼引人注目的弧形吧台 The dramatic curved bar. 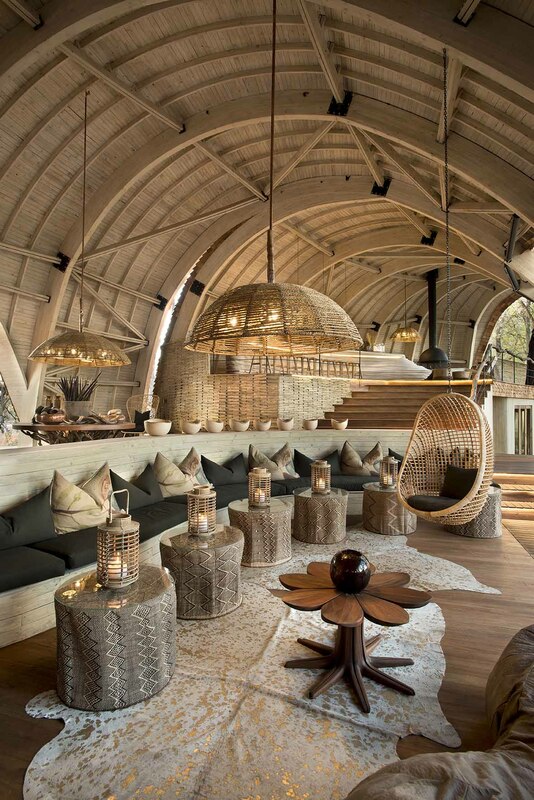 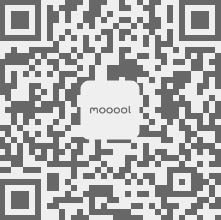 ▼温馨的开放式休息厅内景 Interior of the warm open lounge. 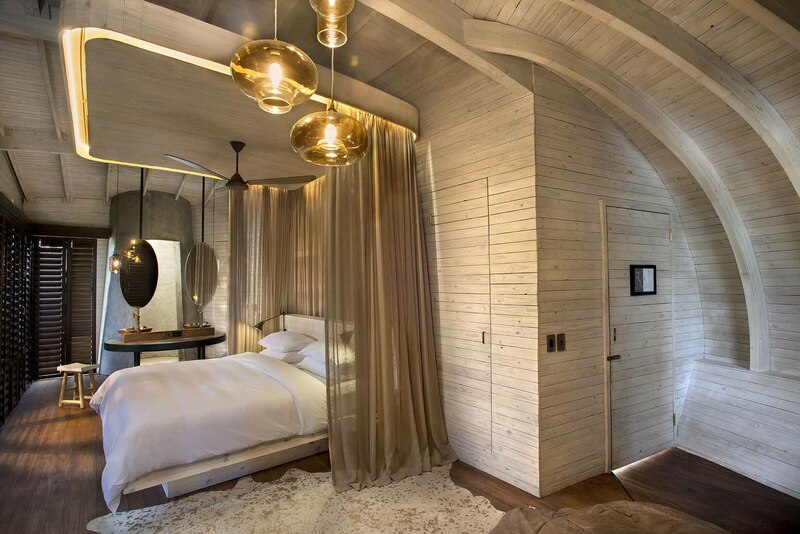 Each suite is lifted from the ground level to achieve a feeling of being in the trees and to make the most of the views. 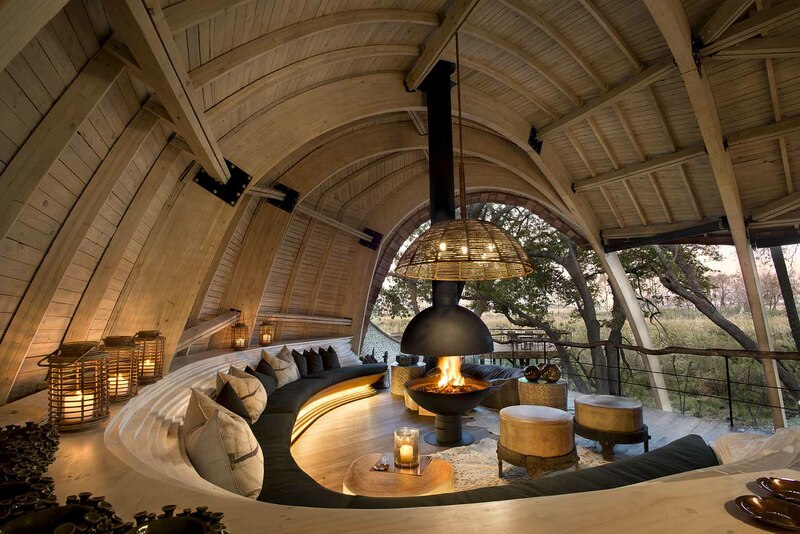 Carefully situated into the landscape, they are organised as a sequence of internal and external spaces with lounging areas, private outdoor dining and a private plunge pool and to provide warmth in colder days, each is fit with a wood burner.